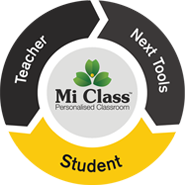 Mi Store is an exciting space where you can access all the interesting tools, technologies and digital content built by LearnNext and TeachNext, as well as other products such as labs, activities and assessments. You will find yourself visiting Mi Store often. Watch this space for updates on new offerings at Mi Store. Your very own NLC bag to carry your stuff in! Jot the important points from your session in your NLC notebook. Learning can be thirsty work!